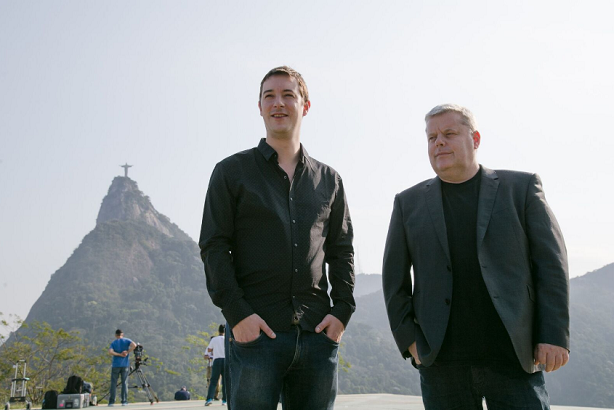 PRWeek chats to comms pros in Brazil: Alasdair Townsend and Patrick O'Neill, the British pair running Anglo-Brazilian agency Sherlock Communications, have been enjoying swimming and fencing, and trying to ignore the doom-mongering. Why have you gone to Rio? Alasdair Townsend (pictured below at fencing competition): We actually have permanent bases in Rio and São Paulo so we have not had to come far. As an agency we specialise in helping international brands break into Brazil, bridging the cultural and commercial gap, and have a number of clients looking to capitalise on the Olympic opportunity. Given the build up to the Games, were you apprehensive about attending? Patrick O'Neill: Absolutely not. We know Brazil and Rio de Janeiro and we knew the doom-mongering was exaggerated. There are lots of brands and companies smart enough to see through the negativity and realise it's still extremely important to have a presence in the world's sixth largest market. Does it feel like the Brazilian authorities’ and Games organisers’ PR operation is running smoothly? AT: After a largely ineffectual build-up, the opening ceremony was a game changer and the tone of coverage since has been largely positive. The main PR challenge now comes from the empty seats at some events, but that has less to do with the Brazilian authorities and more with the strict rules imposed by the IOC. Which sponsor or other brands are shining through for you? PO: While we like Samsung's installations, none of the major sponsors have captured the cultural nuances and engaged audiences in the same way as Google. The stations are full of posters for Google Translate, translating Carioca colloquialisms into English. What do you think will be your abiding memory of the trip? 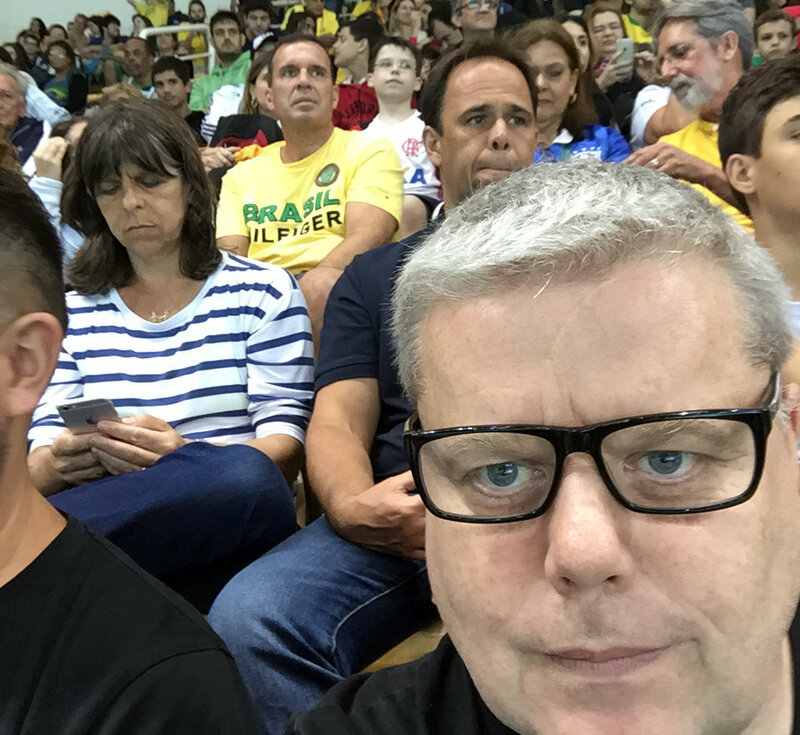 PO: Our abiding memories will be being there to witness the incredible achievements of Michael Phelps [Patrick pictured below at pool], and particularly Rafaela Silva, along with the sheer feel-good factor evident among everyone we know. Which athlete would you most like to get a selfie with? AT: Not a current athlete but given the change in mood since the opening ceremony, it would have to be Vanderlei Cordeiro de Lima. 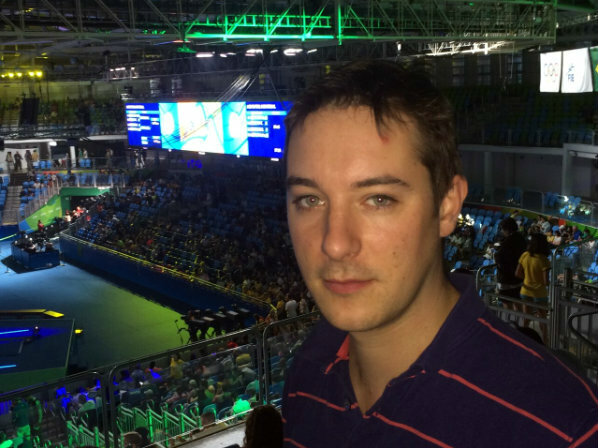 The man who lit the Olympic Cauldron and a true sportsman. What souvenirs are going to be coming back home in your suitcase? PO: Well, as we live in Brazil we won't be taking too many souvenirs but perhaps the best thing we'll take out of the experience will be the greater appreciation of Brazil among our international friends and contacts. There are still many misunderstandings and erroneous assumptions made about the country and Rio 2016 will certainly play its part in redressing that balance.